Police dressed in riot gear gathered on Tucker Boulevard on Sept. 15, the day Jason Stockley was found not guilty in the first-degree murder of Anthony Lamar Smith. One suit was filed last Friday by the ACLU, alleging that protesters’ rights to free speech and due process were ignored. The other was filed Tuesday by two people who were arrested on Sept. 17 during a mass roundup in downtown St. Louis. 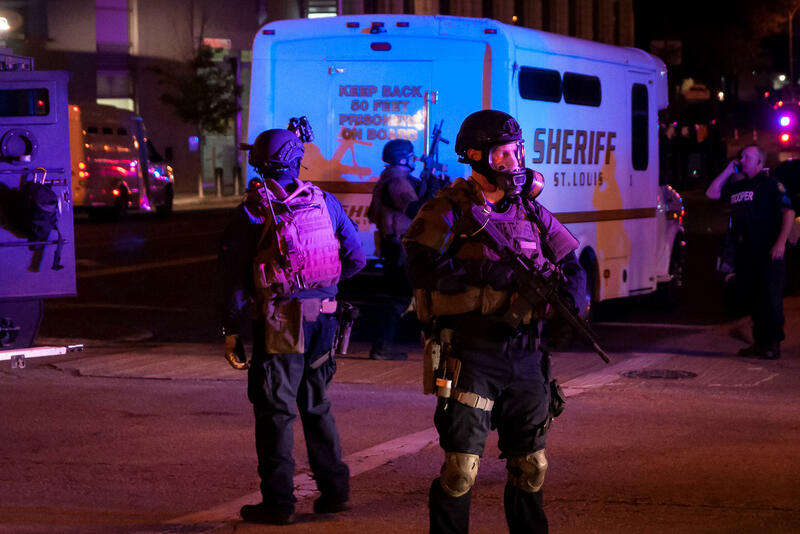 A St. Louis Post-Dispatch reporter, a Getty Images photographer, an undercover officer and people who lived in the neighborhood but weren’t protesting were among those arrested. “These are troubling and difficult allegations, and it is important to determine if they are merited and, if so, what policy, training or discipline issues need to be addressed,” the statement, issued by the mayor’s office, said. There were no specifics provided about the grievances that have been filed. ACLU of Missouri Legal Director Tony Rothert said the city's call for an independent investigation "is a step in the right direction." The protests are part of ongoing demonstrations that began after a judge found Stockley, a former St. Louis police officer who is white, not guilty of first-degree murder of Anthony Lamar Smith, a black man. 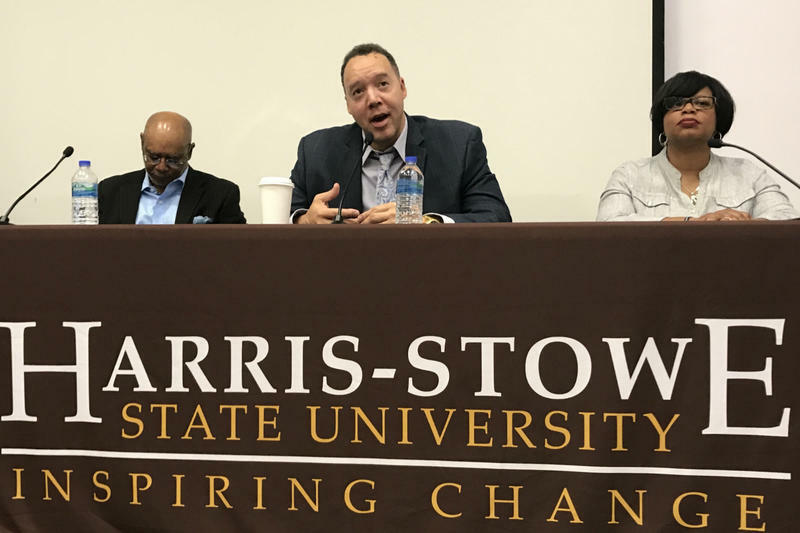 After the Sept. 17 protest and arrests, O’Toole said in a news conference that police “own the night.” Protesters have called for his resignation. Law enforcement officers arrested more than 120 people on Sept. 17 after protests in downtown St. Louis, including the plaintiffs in the most recent lawsuit against the City of St. Louis. Two people detained on Sept. 17 as part of the St. Louis Metropolitan Police’s sweep of protesters have filed a federal lawsuit against the city of St. Louis. This is in addition to the federal civil rights lawsuit filed earlier by the ACLU against the city for police actions over the course of several protests. Drew and Jennifer Burbridge are married documentary filmmakers who were in St. Louis to film and observe the protests. The lawsuit states that the couple were illegally detained and that the police sprayed them with chemicals, physically assaulted them and then arrested them on false charges. The Burbridges were among more than 120 people who were arrested that evening — including several neighborhood residents who were out for a walk, a St. Louis Post-Dispatch reporter and a photographer for Getty. 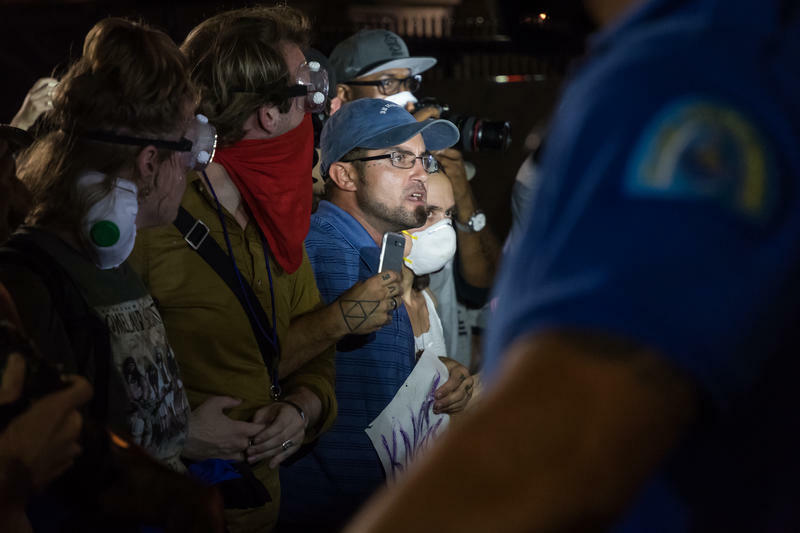 The protests were part of the ongoing demonstrations that began Sept. 15 when a judge found a former St. Louis police officer, Jason Stockley, who is white, not guilty of first-degree murder of Anthony Lamar Smith, a black man. The lawsuit includes three unnamed police officers, as well as the city of St. Louis and the police department as parties in the case. According to the lawsuit, both Drew and Jennifer Burbridge identified themselves as bystanders, but the police still detained them. The suit says two officers threw Drew Burbridge to the pavement and repeatedly kicked him, even after his hands were restrained behind his back. Both Drew and Jennifer were detained for 20 hours. The couple is seeking compensatory damages for the actions of the police. Alison Dreith, one of two women who are suing the city of St. Louis over the way it is policing protests, is helped by the Rev. 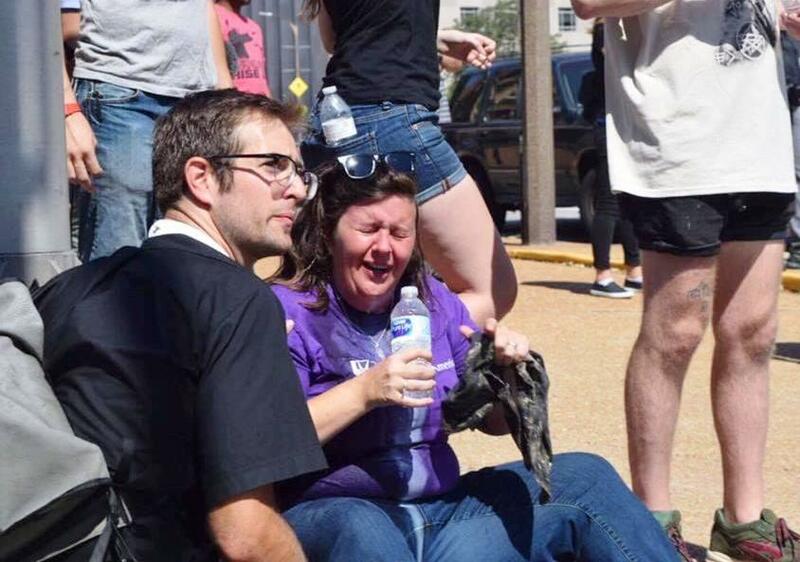 Jon Stratton of Trinity Church in the Central West End after she was hit with pepper spray during a protest on Sept. 15, 2017. The ACLU of Missouri has sued the city of St. Louis for the way police have handled protests following a judge’s decision to acquit Stockley of murder in the 2011 shooting death of a Smith. The federal civil rights lawsuit filed Friday accuses the St. Louis Metropolitan Police Department of violating protesters’ rights to free speech, due process, and the right to be free from unlawful arrests. The suit asks a judge to order the department to police the protests constitutionally. Protesters have been on the streets since last Friday, when St. Louis Circuit Judge Timothy Wilson found Stockley not guilty of first-degree murder. Stockley shot and killed after a car chase in 2011. The lawsuit accuses the department of illegally detaining people by blocking them in between police lines and then arresting them after a protest on Sunday, and of indiscriminately using chemical agents like pepper spray on peaceful protesters. Alison Dreith and Maaleah Ahmad, the two plaintiffs, were unexpectedly hit with pepper spray while marching downtown on Sept. 15, the suit said. "I think everyone deserves the same rights as I do. I want peace and justice," Ahmad said through the ACLU. "If it hadn't been for my fellow peaceful protestors — strangers who came to my aid — I don't know how my eyesight would be today. I would have been left out in the sun, on the ground, with my face burning." Maleeha Ahmad, a plaintiff in the lawsuit, was hit with pepper spray when talking to a line of police on September 15, 2017. St. Louis police have routinely prevented marchers and bystanders from recording what officers are doing, in violation of their right to do so, the suit claims. Dreith said through the ACLU that St. Louis should be a place where people do not worry about retaliation from law enforcement. "We should strive to be a place where every citizen feels supported by the communities we call home," she said. This is the vision that drives us into the streets and inspires us to hold our leaders accountable when they betray our values." The ACLU also is suing on behalf of those who have protested or will protest in the future. A spokesman for Mayor Lyda Krewson said she had not yet seen the suit.